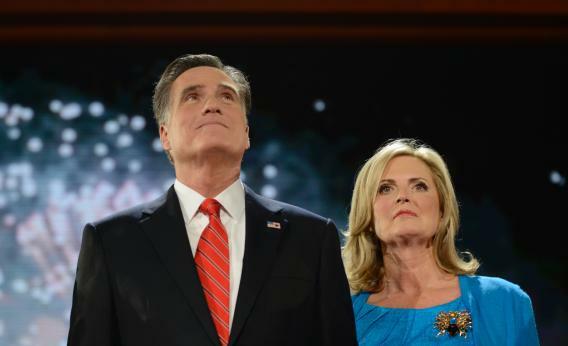 Romney on mothers: If Ann's work is harder and more important, why isn't she running for president? Photograph by Brendan Smialowski/AFP/Getty Images. One of the Romney campaign’s most controversial moves has been its decision to persist with widely debunked claims that the Obama administrtaion is gutting the work requirements attached to TANF money. But questions about truth-telling aside, the Romney policy view here is clear—spending money to bolster the living standards of single mothers is fine, but they have to be made to engage in paid work in the labor market both for their own good and for the good of society. But then again, when Hilary Rosen said that lifelong homemaker Ann Romney “never worked a day in her life” the Romney team purported to be outraged on behalf of mothers everywhere. And last night accepting the Republican Party nomination for president, Romney left the welfare attacks unmentioned and instead doubled-down on the idea that non-market work is crucial. That’s a provocative idea. And indeed it’s part of the idea behind the original pre-reform version of TANF known as AFDC. This idea, representing state-of-the-art 1930s thinking about gender roles held that the state should act as a breadwinner figure for families with dependent children that lacked adequate income. The idea wasn’t that mothers in such families “aren’t working” it’s that they’re doing the job of a mother, which is often conceptualized as “harder” and “a lot more important” than the job of earning wages in the labor market. But as more and more middle class women began engaging in paid work even after having children, this came to seem as obsolete to many people. AFDC was seen as a poorly designed program that created bad incentives and encouraged resentment on the part of working people. So both that specific program and the American “welfare state” as a whole were substantially reformed over the course of the 1980s and 1990s to put much more emphasis on subsidizing the living standards of the working poor (through EITC, Medicaid, and the revised version of TANF) rather than old-fashioned check writing. But now here’s Mitt Romney telling us that Ann Romney’s work is both harder and a lot more important than the work he did at Bain & Company and then later at Bain Capital. So what to make of that? Most likely the answer to the riddle is that he’s just bullshitting (in the Harry Frankfurt sense) about the importance of homemakers. After all, he’s the one running for president, not the spouse who purportedly did the harder and more important work. And the content of the GOP convention was overwhelmingly about the need to unchain the job creators, emphasizing over and over again that entrepreneurship and paid market labor are more important than childrearing and housekeeping. Romney even bragged that as governor of Massachusetts he appointed lots of high-ranking women to office—something he presumably did because he thought helping him govern a medium-sized state is actually more important than raising a handful of children. But there really is a profound difference here. The Obama administration, more or less, wants to encourage women’s full participation in the American economy. They’re advancing that goal through legislation barring pay discrimination and through legal abortion and subsidized contraception. They’re reforming the individual health insurance market so women will no longer pay higher premiums than men, so women will have an easier time switching jobs and launching businesses. They’ve proposed doubling the child care tax credit, one of several working-class tax benefits that would be eliminated under the Romney/Ryan plan. By contrast, Romney has nothing. He doesn’t say women should go back to the kitchen, stop working, and instead do the much harder and more important job of raising kids full time. But he doesn’t want to spend any money or burden any business with any kind of rules or programs that would push us to a new more egalitarian equilibrium. Nor does his lip service to the values of full-time childrearing seem to have any content. He thinks the idea of paying poor women to stay at home and raise kids is outrageous and certainly doesn’t encourage fathers to engage in the much harder and more important job of full-time homemaking. He’s a guy who loves his wife and wants to say something nice about her when given the opportunity to talk on a national stage, and he’s a guy who doesn’t want to do anything to address the challenges that parents face in an economic environment shaped around the obsolete expectation that behind every working man there’s a full-time homemaker. But he’s not a guy who in any way acts as if there’s any content to his belief that full-time parenting is harder and more important that entrepreneurship or market labor.